Merletto is literally the Italian word for "lace". 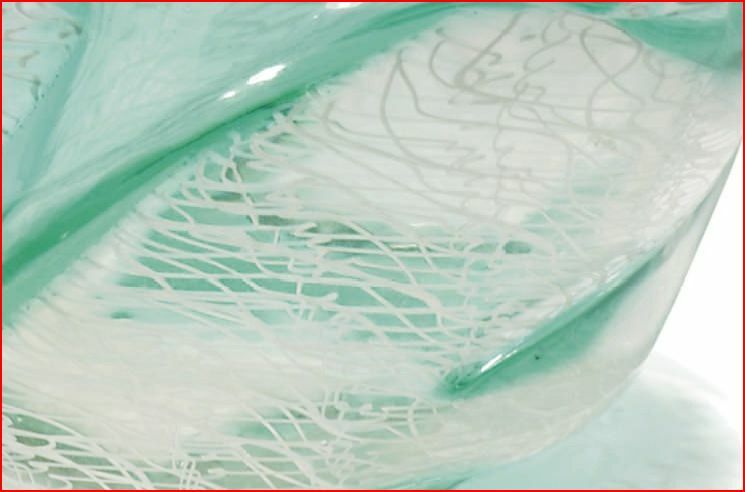 In Glass Art, Merletto is a network of lattimo (opaque white glass) threads. I became interested in Merletto because of the Fin Molds used to create them. 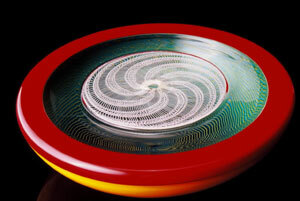 The main difference between this type of fin mold and a standard optic mold is the amount of distortion you are capable of producing. The blade edge of a fin mold really hangs up the glass and lets you push that material far up towards the moile, in contrast to a Steinert mold. 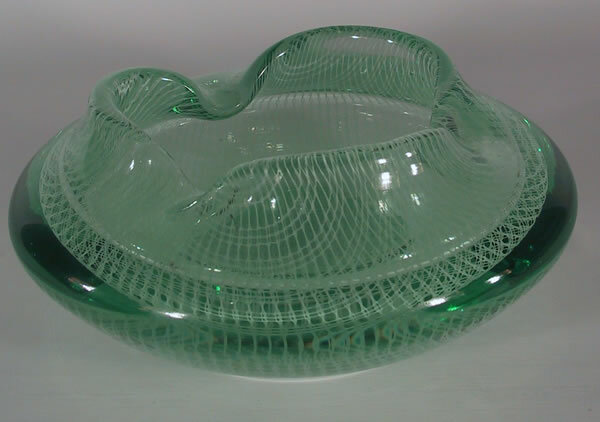 The particular look is a little different, as well since the hot glass moving on either side of the fins' edges tend to produce much more of a folded look in comparison to an optic molded wave. Although they're the same family, there are some pieces that do indeed call for a fin mold. 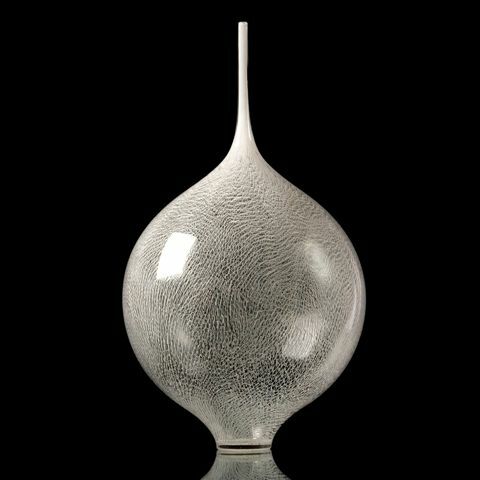 What comes to mind first is Seguso's "Merletto" series. There's a lot more to the pieces than just repeated stamping and twisting in the fin mold, but look close at the distortion of the lines. That's more fin than not, if you ask me. Vetreria Archimede Seguso, designed and executed by Archimede Seguso, Merletto, translucent blue internally decorated with unique lacework canes. paper label. 10 1/2"H. Very good condition with no chips, cracks or repairs. Designed by Archemide Seguso for Vetreria Archemide Seguso. Circa 1952. 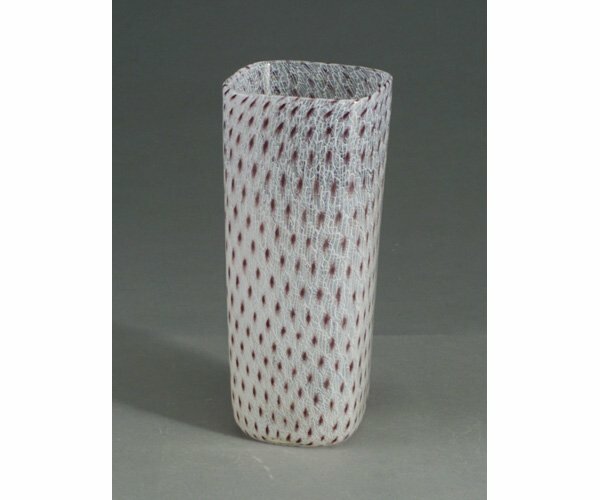 Description	ARCHIMEDE SEGUSO Freeform Merletto glass vase in white and amethyst. 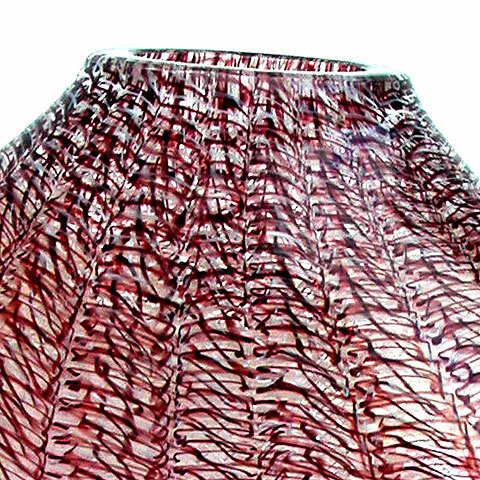 Red foil label, Made in Murano Italy. 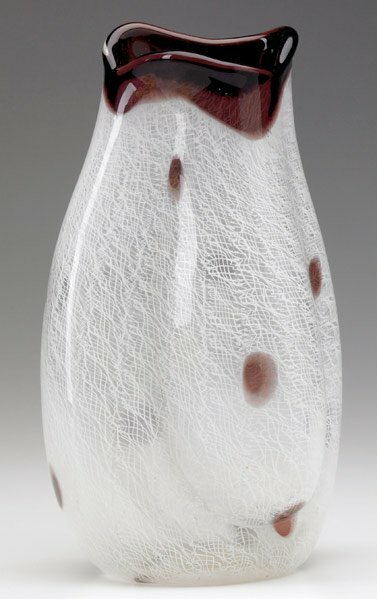 8 1/2" x 4 3/4"
It's not unusual for glassblowing, particularly Venetian glassblowing, to be described in terms of dance (choreography comes with the territory, courtesy of the combination of teamwork and material temperament). In the case of Tom Rowney's work, the dance is elegantly mannered. Courtly, even. 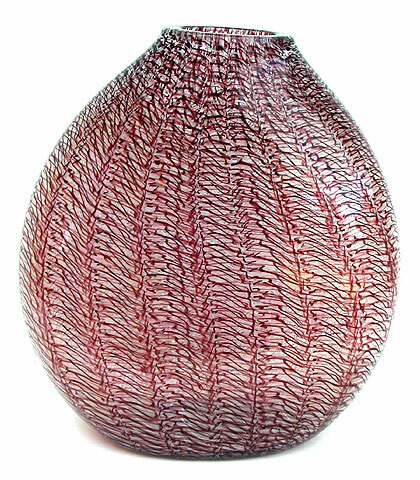 Description	Fine, large, rare ARCHIMEDE SEGUSO four-sided merletto glass vase with white filigree and translucent amethyst decoration. Unmarked. 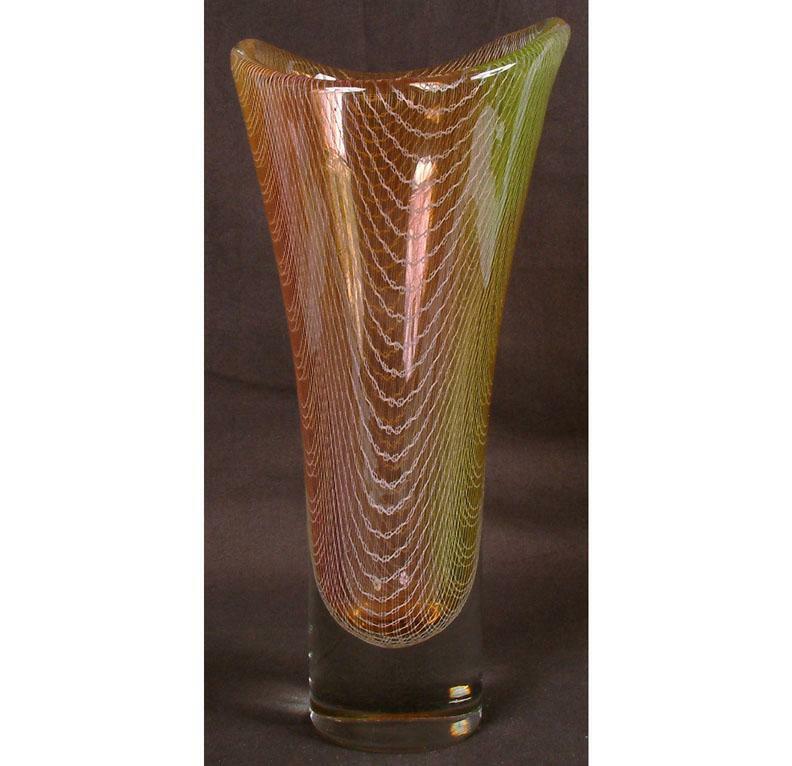 11 1/2" x 4 3/4"
Harrtil Merletto Art glass vase, internal decoration of fine netting and pink and yellow shading. Possibly the best example of this technique. 12" tall. Excellent condition with almost no surface wear. 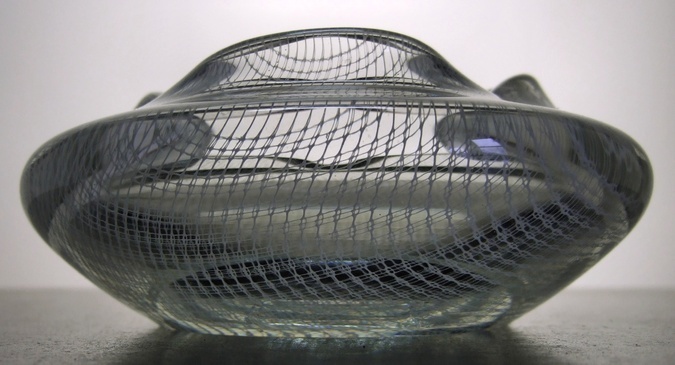 n 1955 the Harrachov factory in Bohemia in Czechoslovakia launched a range of art glass called Harrtil. It was developed by designer Milan Metelak and factory manager Milos Pulpitel. 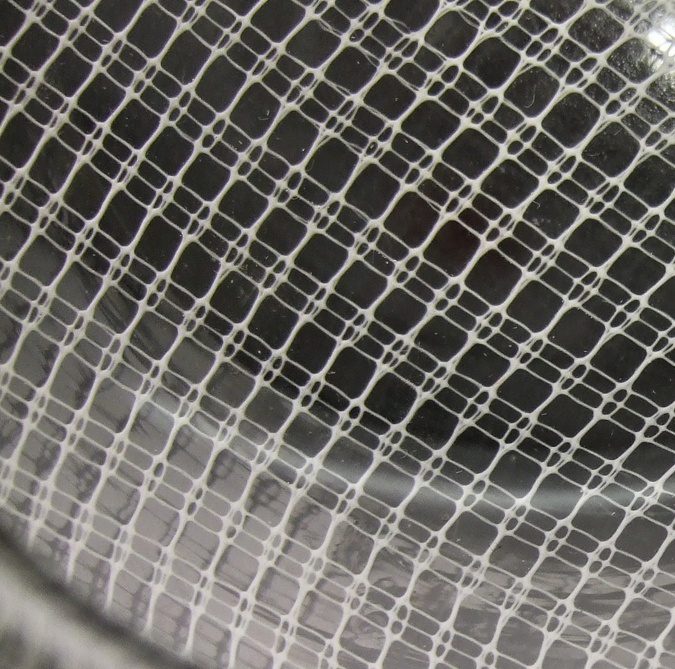 The fine white mesh of woven glass fibres (known as "merletto" - net - in Italian) trapped within heavy glass casing can be seen in all the pieces in the series. 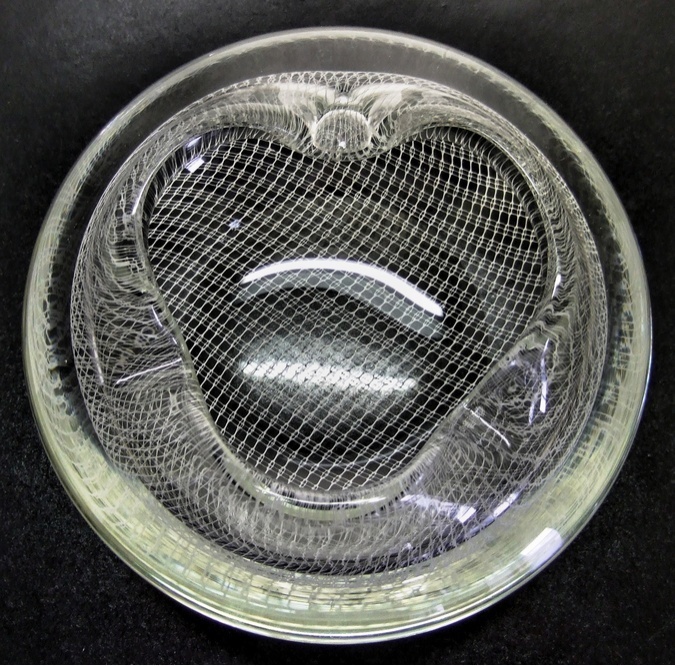 Harrtil is often mistaken for the merletto pieces of Archimede Seguso, but the mesh on the Seguso works are an illusion created by joining two blown bubbles with filigree lines, thus creating a net-like effect. 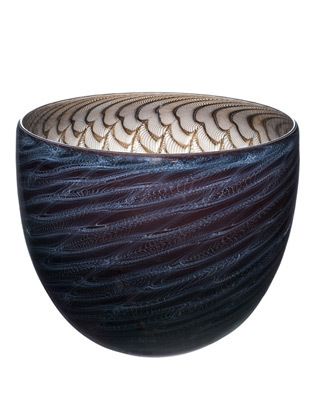 Harrtil, on the other hand is made with a genuine net of woven glass. 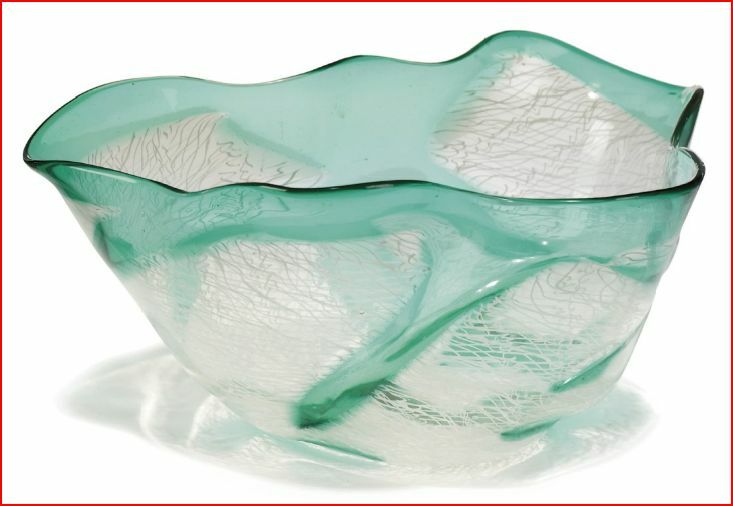 Stunning Mid-century HARRTIL art glass bowl. 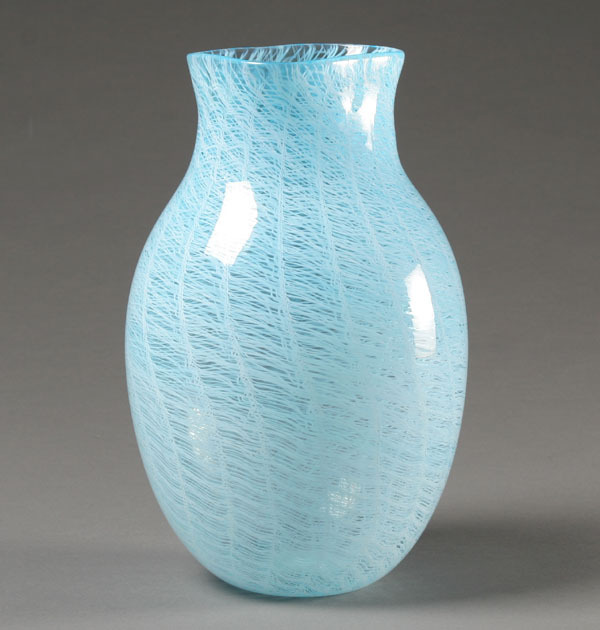 Fine Merletto-like strands are symmetrically placed throughout the glass. 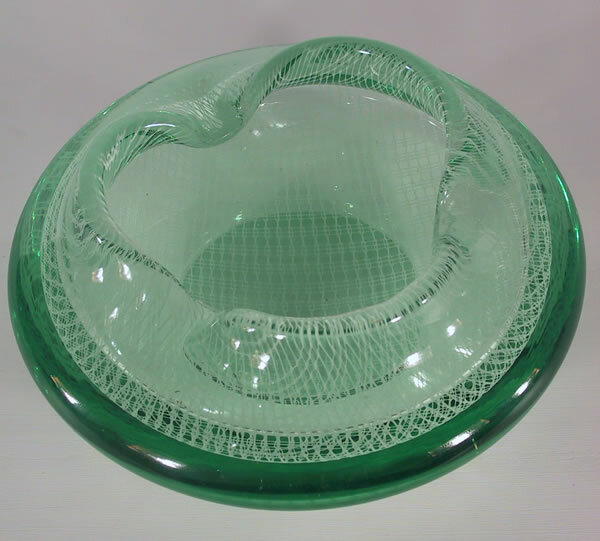 Designed by Milan Metalak, the sealing of textile fiber within glass was a major turning point in the 50's for Czech art glass. Excellent shape with no chips or cracks.